Electronic Kit School. - This is electronic circuit for you who want to build low drop adjustable voltage regulator power supply with high current more than 10A this time. 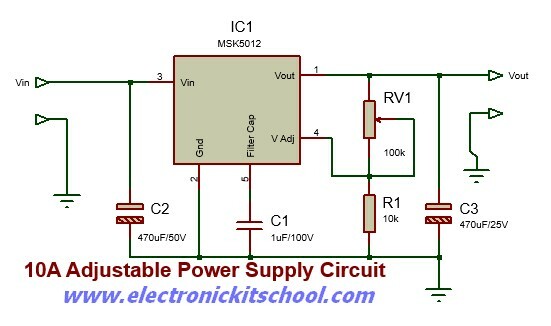 The main component that you can use to build this power supply is MSK 5012 IC. According from the data sheet this IC mentioned that MSK5012 IC is a highly adjustable voltage regulator which can give the output voltage with can programmed using two resistors. As mentioned before that this IC also has a very low dropout voltage(0.45v @10A) due to the usage of MOSFET with very low Rds (ON) as the internal series pass element.This IC also provide high level of accuracy and ripple rejection is around 45dB. With available 5 pin Sip package which is electrically isolated from the internal circuitry, make this IC can give the freedom to fit the IC directly to the heat sink and this sort of direct heat sinking improves the thermal dissipation. In here beside we give you circuit of 10A Adjustable Regulator Power Supply Circuit using MSK 5012, we also will show the component parts of this circuit and describe about this circuit after it. Circuit like in Figure 1 above show you about the 10A Adjustable Regulator Power Supply Circuit using MSK 5012 that can produce regulated voltage output with change the resistor value R1 and R2 with current output 10A. For all applications, value of R2 is fixed to 10K. The relationship between R1,R2 and output voltage Vout is according to the equation R1=R2(Vout/1.235)-1. C1 is a filter capacitor which is also a part of the gate drive circuit of the internal series pass MOSFET. Around three times the input voltage will appear across this capacitor and so the its voltage rating must be selected accordingly.C2 is the input filter capacitor while C3 is the output filter capacitor. With the circuit above you can implement it with giving the input voltage with voltage 3v to 36v DC. According it the output voltage can adjust with voltage range 13v to 36v DC. This circuit also will give the high efficiency linear regulators, constant voltage/current regulators, system power supplies etc. As note also that you should using heat sink to reduce the heat of this component when used because this IC have a heat sink with thermal resistance not more than 2.40 oC/W must be fitted to the MSK5012.